The Coconino National Forest (CNF) in north-central Arizona is approximately 1.8 million acres, and sits on the southern edge of the Colorado Plateau. The CNF’s highly diverse landscape ranges from the highest points in Arizona, the 12,000 foot San Francisco peaks north of Flagstaff, down to the Verde River, at an elevation of 2,600 feet, at its southern boundary. CNF is also blessed with significant water resources, with 224 perennial stream miles within its boundaries, more than 200 springs, over 10,000 acres of wetlands, constructed reservoirs, and countless intermittent and ephemeral streams. Map of Coconino National Forest boundary. Map Credit: The Nature Conservancy. The CNF includes a host of scenic and recreational icons within its boundaries. These range from the red rocks of Sedona and Oak Creek Canyon, to Arizona’s popular skiing destination of Snow Bowl, to the only two designated Wild and Scenic Rivers in Arizona – the Verde River (whose management is shared with Prescott National Forest), and Fossil Creek, one of the largest tributaries to the Verde River. The CNF also manages a number of significant archaeological, cultural and historic sites, such as Palatki, Elden Pueblo and Honanki. Like all national forest lands, the CNF supports numerous uses to benefit the public and surrounding communities. 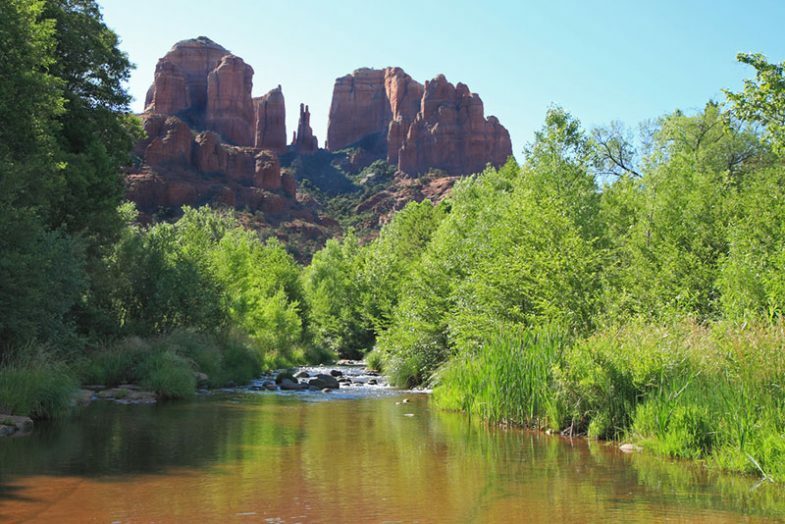 The most popular activities reported on Coconino National Forest are recreational in nature and include viewing scenery and natural features, hiking, wildlife viewing, relaxation, and driving for pleasure. The CNF also supports a variety of traditional uses, such as livestock grazing, timber harvests, and mineral development. However, the majority of the timber harvest projects are focused on thinning overgrown stands of trees in order to reduce fire risk to adjacent communities, restore forest health, and improve habitat. Given the size of the CNF, the management of the lands are divided into 18 management areas. 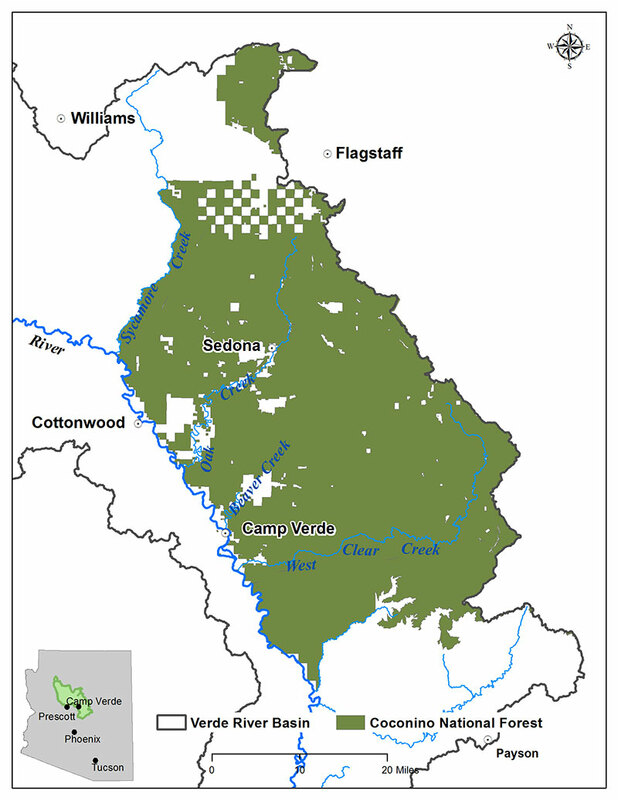 The Verde Valley Management Area covers approximately 320,000 acres of land in the southwestern area of the CNF, and encompasses the perennial rivers and streams of the Verde River watershed. These include the Verde River itself and its main tributaries – Sycamore Creek, Oak Creek, Wet Beaver Creek, Clear Creek, and Fossil Creek. Cathedral Rock near Oak Creek, a tributary to the Verde River, on the Coconino National Forest. The CNF’s management goals for the Verde River watershed involve reducing flooding and sedimentation in downstream communities through treatments such as forest thinning projects, prescribed burns, channel stabilization, streambank stabilization, native vegetation restoration, and improved riparian and soil function. The Verde Valley Management Area is also home to five wilderness areas and the designated Wild and Scenic stretches of the Verde River and Fossil Creek. Recreational activities are highly popular and include motorized recreation, such as ATV and OHV riding, as well as camping, hiking, swimming, biking, wildlife watching, hunting and fishing, and river-related activities. To learn more about the CNF’s work to protect watershed health, or to find out about recreational activities and events supported on the CNF, please visit its web site here. If you are interested in learning more about the priorities and objectives in the CNF Land and Resource Management Plan, a link to the draft plan can be found here.